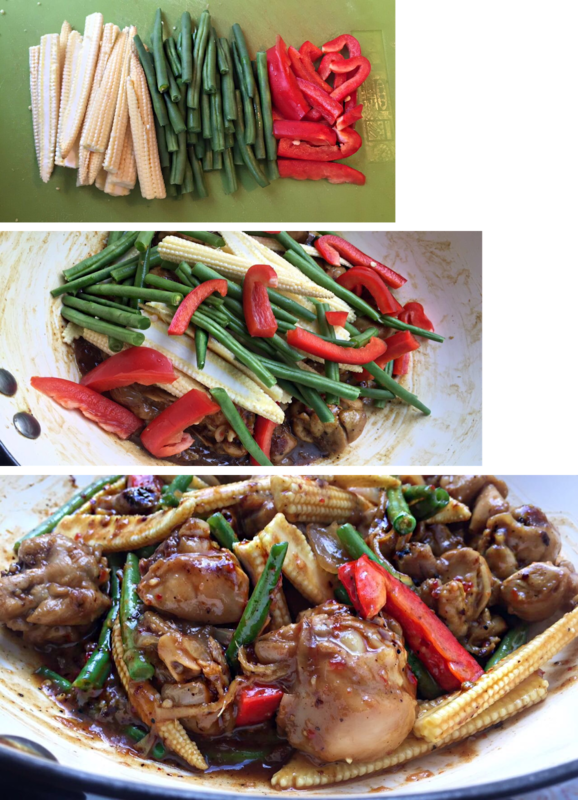 This recipe was the result of my love for Chinese food and a lazy winter afternoon. With very little ingredients, this quick and healthier (in comparison to takeaways) option will surely satisfy your cravings. If you hadn't already guessed from the title, we will be using soy sauce. Please keep in mind that soy sauce is salty, so restrain from adding salt till the end. 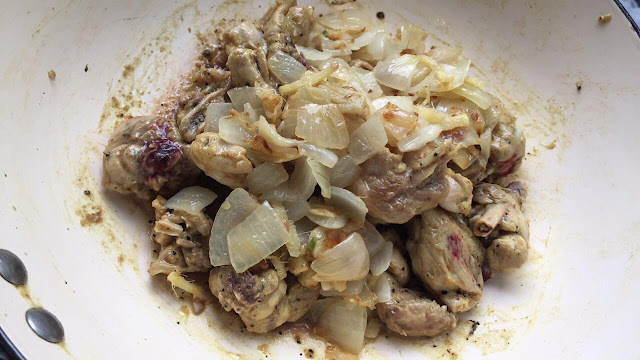 - to marinate: 1 1/2 tablespoon of ginger and garlic paste, pepper and 1/4 teaspoon of salt. With regards to the vegetables, please feel free to add anything you like. Personally, sometimes I like to add broccolini. 1. 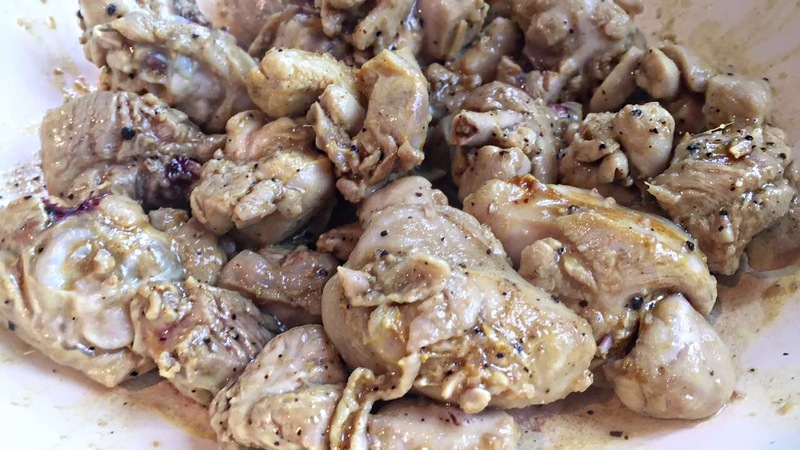 The first thing you need to do is marinate the chicken with 1 1/2 tablespoon of ginger and garlic paste, 1/2 tablespoon pepper and 1/4 teaspoon of salt. Once you have done this set it aside. 2. Put your pan on the stove and pour a bit of vegetable oil. 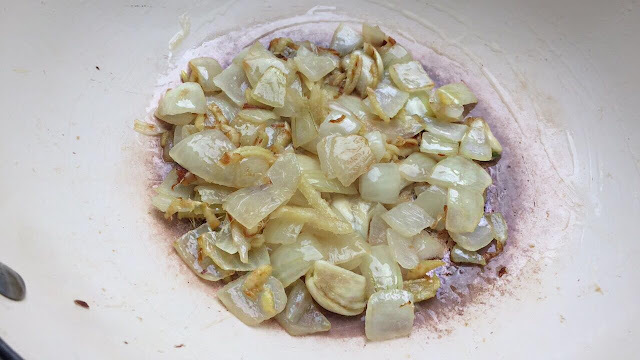 When the oil is slightly hot, add the onions with the ginger and garlic till it is translucent with a slight golden tint. 3. Once it gets to this stage, set it aside. 4. In the same pan, add the chicken and let it cook for few minutes. 5. When the chicken looks somewhat like the above image, add the onions. 6. Now add the soy sauce and sweet chilli sauce. Pour some water, close the pan and let the chicken cook for about 25-30 minutes on medium heat. 7. Now that the chicken is cooked, you can go ahead and add the vegetables. The reason I like to leave it till the end is because it will still have the crunch. This would also be the perfect time to check for seasoning - taste it and add salt to taste. At this stage I did add some chilli flakes because I love spicy food but that is up to you. 8. Let it bubble away for another 4-5 minutes. 9. To finish it off and to thicken the gravy add the corn-starch. -If you are a vegetarian you can always make it with more vegetables it would taste just as good. -There are times I switch the meat to beef, it works well with any meat. -This particular recipe is lovely with some plain rice but you can make it with boneless chicken and that would be great with noodles. 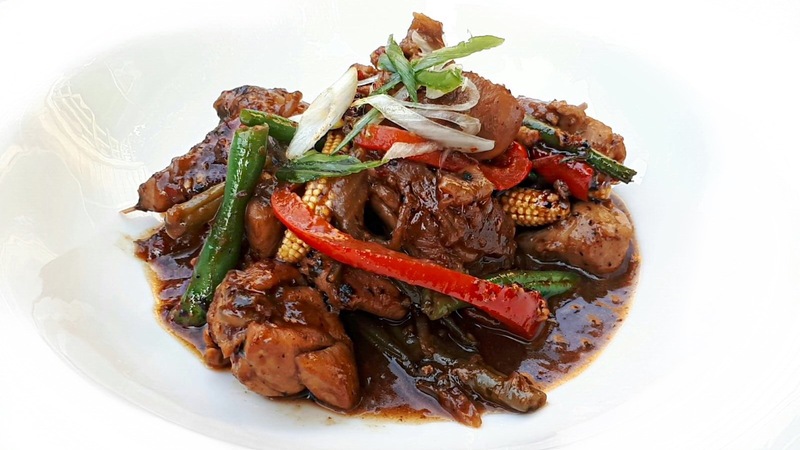 Hope you try to make this Chinese inspired dish and if you do please do share it with me, I would love to see it.